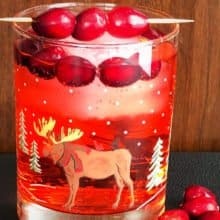 This delicious Cranberry Rum Ginger Ale is an Excellent Cocktail / Mocktail for the holidays! Garnish with fresh cranberries on a skewer. You can also make this a mocktail by simply excluding the rum and the kids will love it!